Macau houses many beautiful ancient Chinese temples, which have served as the key places of worship for hundreds of years. 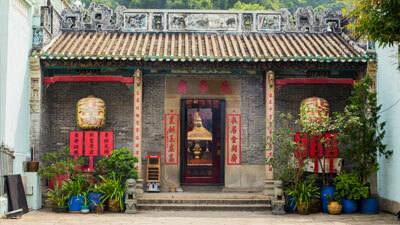 Macau temples primarily serve the Buddhist, Taoist and folk faiths. 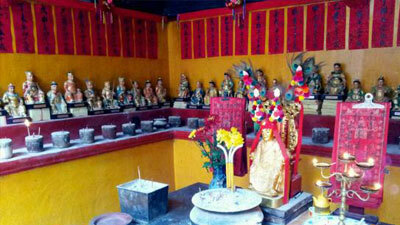 Buddha, Na Tcha, Tin Hau (Goddess of Seafarers) and Kun Iam (Goddess of Mercy), etc., are all revered in various temples. 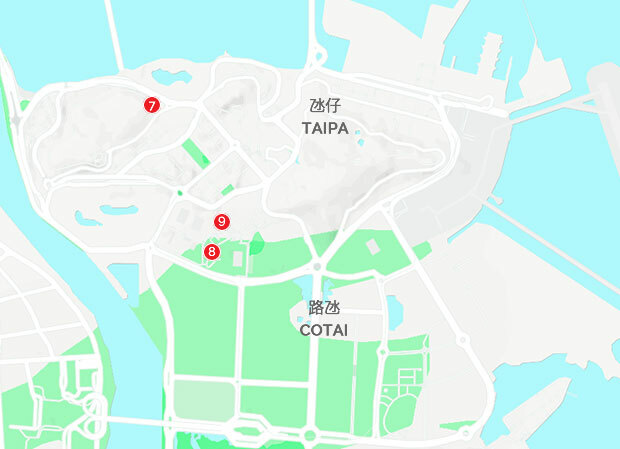 By visiting Macau’s diverse temples, sightseers can learn more about traditional Chinese beliefs and the city’s historical origin as a fishing village. 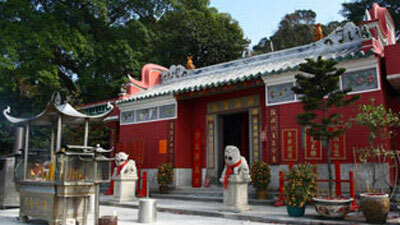 A-Ma Temple: one of the oldest and most famous temples in Macau. Built in 1488, the temple is dedicated to Matsu, the goddess of seafarers and fishermen. The name Macau is thought to be derived from the name of the temple. It is said that when the Portuguese sailors landed at the coast just outside the temple and asked the name of the place, the natives replied “A-Ma-Gau” (bay of goddess A-Ma). 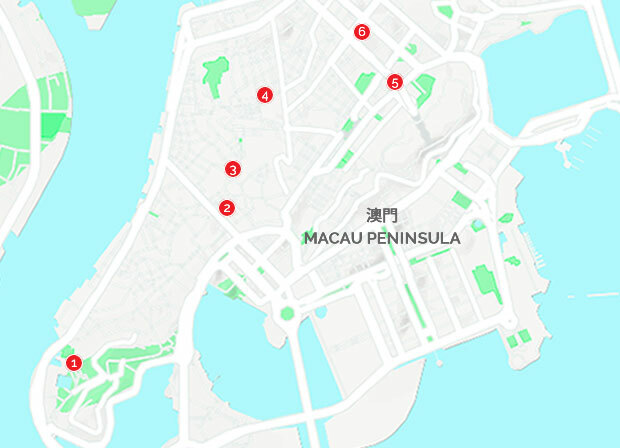 The Portuguese then named the peninsula “Macau”. A-Ma Temple is an exemplary representation of Chinese culture inspired by Confucianism, Taoism, Buddhism. One of the 3 temples included in the UNESCO world heritage. Sam Kai Vui Kun was built in 1750 initially as the meeting place of Chinese tradesmen and was dedicated since its foundation to Guan Yu (Kuan Tai) – the God of Martial Arts and God of Wealth. This temple is located close to the old Chinese Bazaar area, which nowadays functions as St. Dominic’s Market, still keeping the essence of the original function of the area. The location of this Chinese construction at the heart of the main city square with its predominantly western-style architecture illustrates the harmonious coexistence of the two cultures. This temple is directly associated with long-standing Chinese business associations, precursors to the Chinese Chamber of Commerce in the city. Built in 1888, this temple is dedicated to the worship of Na Tcha. This small traditional Chinese temple stands close to the remains of the principal Jesuit enterprise of the region, presenting dialectic of western and Chinese ideals, as one of the best examples of Macau’s multicultural identity and religious freedom. Opening hours: 7:30 a.m. to 5:15 p.m. Dating from the 17th century, this temple occupies a square off Estrada do Repouso in the Patane district, where a regular flea market is held. The temple has facade with some fine granite carvings on the walls and ridgepole and large Chinese lion statues on the roof. 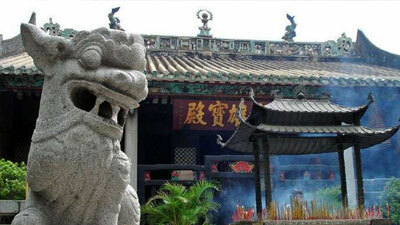 The main hall is dedicated to Ua Kuong, the dark-faced god who protects against fire. He is attended by Thousand-Li Eye and Favourable-Wind Ear. In one adjoining hall are goddesses associated with childbirth and rearing. Along the walls are 18 statues of goddesses with children, brightly coloured and expressive clay figures of the 60′ year’ gods. A further hall is dedicated to the Monkey God, a popular character from Taoist mythology and hero of the literary epic monkey. 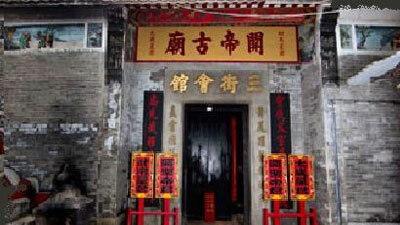 The Lin Kai Temple supports a hospital and poor people’s home. Opening hours: 7:30 a.m. to 5 p.m. It is one of the biggest and wealthiest of Macau’s temples with a huge entrance gate and roofs clustered with porcelain figures. This Buddhist temple dedicated to the Goddess of Mercy was founded in the 13th century and the present buildings date from 1627. Separated by open courtyards are richly decorated halls dedicated to the Precious Buddhas, the Buddha of Longevity and Kun Iam, who is dressed in embroiled silk with a fringed crown (which is changed every year). In adjoining rooms are funeral chapels and scrolls honouring Kun Iam in pictures and calligraphy. Behind the temple are terraced gardens. In one is the stone table on which was signed the first Sino-American treaty on July 3, 1844, by the Viceroy of Canton Ki Ying and the United States Minister Caleb Cushing. Nearby is the marble statue of a monk in an ornate pavilion, and four ancient banyan trees with branches intertwined which is known as the Lovers Tree and a symbol of marital fidelity. Opening hours: 7 a.m. to 5 p.m. Built in 1592 and most regularly restored, this Temple of the Lotus has a fine facade of intricate clay bas-relief carved in the 19th century depicting historical and mythological figures. Lin Fong Temple is historically famous as the place where for centuries Chinese Mandarins from Guangdong Province would stay when they came to Macao. Stone lions guard the entrance. Inside is a hall with a statue of Tin Hau on the altar, flanked by the guardian generals. Beyond is a courtyard decorated with a frieze of writhing dragons, a lotus filled pond and fine iron brazier. 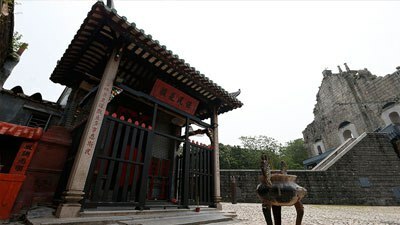 In The temple courtyard you can access Lin Zexu memorial museum., Lin was very well- known for his active and loud opposition to the opium trade, especially in Guangzhou, which was usually considered to be the primary catalyst for the First Opium War. The contribution of Lin Zexu in the fights against opium smuggling was one of the most important in the history of China. Opening hours: 9 a.m. to 6 p.m.
Pou Tai Un on Taipa Island is one of the best-endowed and most picturesque temples in Macao. It was founded in the 19th century by Buddhist monks and the original prayers hall contains images of the three Precious Buddhas. Since then, both the monastery and temples have been extended and enriched by devotees. 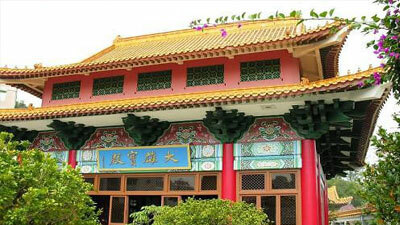 There are new pavilions with soaring yellow-tile roofs and an elegant status of Kun Iam on a marble- columned terrace. The monks live in adjoining building. When not busy with prayers, they tend a large vegetable garden and operate a vegetarian restaurant where some of the produce is prepared. Whether vegetarian or not, visitors will enjoy this casual verandah cafe, where the freshness of the ingredients is matched by the imaginative preparation and wide range of dishes. 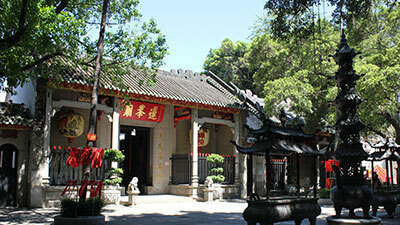 The Temple of Pak Tai was built in 1844 and is second biggest temple of Taipa, after Pou Tai Un Temple. It is dedicated to a martial deity – the Taoist God (Tai) of the North (Pak) – who defeated the Demon King who was terrorizing the universe. A pair of Chinese lions guards the entrance to the temple. On the third day of the third lunar month each year, Cantonese opera performances take place here. Opening hours: 8:30 a.m. to 5:30 p.m. 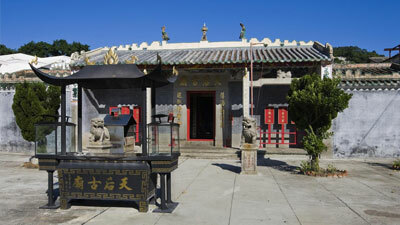 This temple, with a fine toll roof decorated with porcelain figures, is dedicated to Tam Kong, a Taoist god of seafarers. Beside his image, the temple contains a four feet long model of a dragon boat made from whalebone, with a crew of wooden men in red robes and yellow hats. 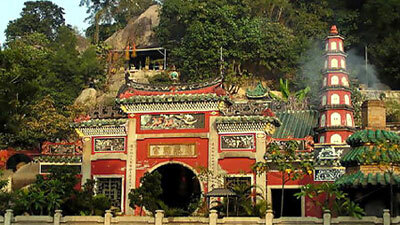 There are two temples dedicated to Tin Hau in Coloane village. The larger, on Largo Tin Hau Miu has, at its entrance, a traditional fire engine, which had to be wheeled by hand. A short distance away, off Travessa da República, is a smaller temple, with some brilliant gilded carvings over the entrance and a moongate facing the sea. Tin Hau Temple (Coloane) Located at Avenida da República west of downtown Coloane, the Tin Hau (Heavenly Empress) Temple was constructed circa 1677. 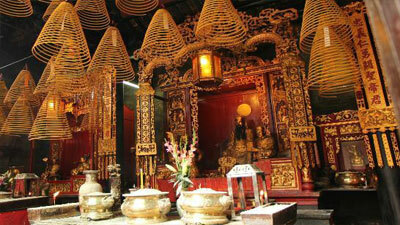 It is the oldest temple in Coloane and the most antiquated collectible is an ancient bell dated back to 1763. Tin Hau Temple (Coloane)It is a single structure housing three halls plus a square-shaped pavilion, “Pavilion of Worship”, for making offerings to Heaven. There are few temples across Macao having a square-shaped pavilion, with Lin Fong Temple being the most well-known of all for having a pavilion like this. Interesting enough, temples with square-shaped pavilion are ones that also functions as a quasi-official meeting place and for resolving matters related to the local community. 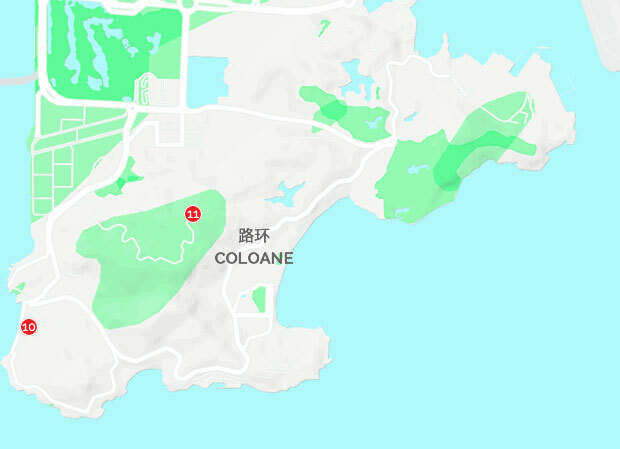 It is obvious that Tin Hau Temple enjoys a special status amongst temples of Coloane.